Whilst I have been to Tuscany many times, strangely enough I have never been to Montalcino. A town that is so breathtakingly beautiful, that the drive in took my breath away. The term ‘beautiful’ would simply not do it justice. I had an appointment with Fuligni before lunch and I was looking forward to this very much. 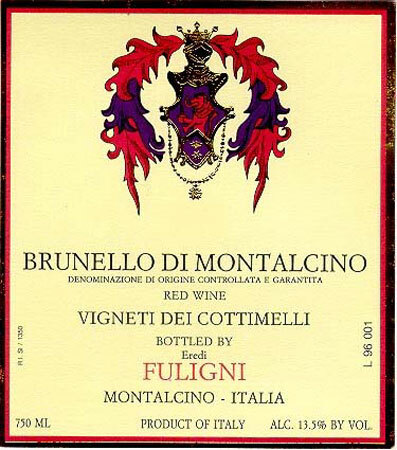 Trembath and Taylor have done an amazing job importing the wines of Fuligni into Australia for many years and the wines of Fuligni would have the largest share of Brunello in my cellar. The 2010 Rosso di Montalcino blew me away. Wow, what a wine! Also the 2006 Brunello Riserva was top shelf and all the other wines were of a very high quality. 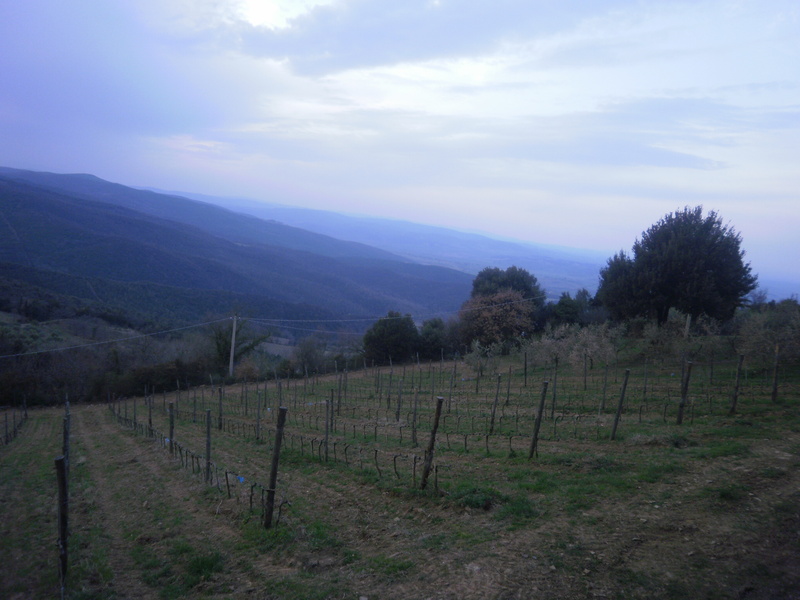 I do not import from Montalcino, but I do now have a better understanding of the region and style and appreciate the work involved in making such a famous wine. Before dinner we stopped by Il Palazzone and met the contagious spirit of estate manager and guardian Laura Grey and her husband Marco. 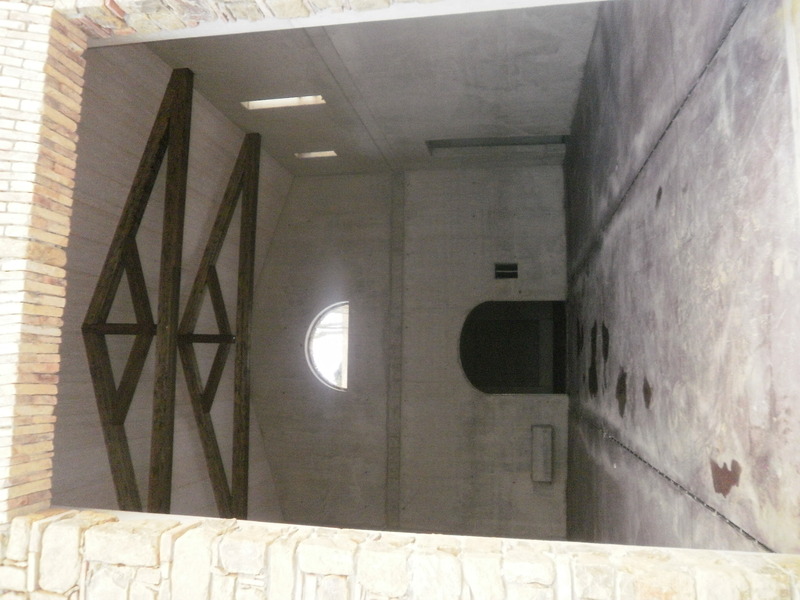 Il Palazzone, or “The Big Palace” is a small estate that has been producing wine for over ten years. 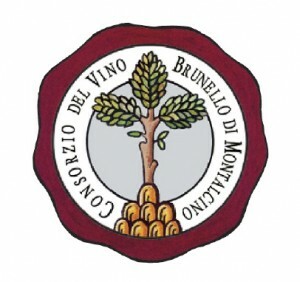 While the estate is roughly 20 acres, the land authorized for the production of Brunello di Montalcino is a mere 10 acres. Obviously, a property of these dimensions creates a tightly controlled environment which is determined by its owner. A New Yorker and a wine lover, not necessarily in that order, the proud owner takes an enormous interest in the vineyard despite the time constrains imposed by his day job as a business man. 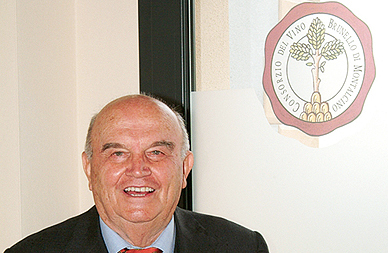 He is personally present at harvest time and all other key moments of the wines development. No care is spared in the entire vinification process, which end result is approximately 20,000 bottles each year. Laura gave us a tour of the estate and then we sat down for a tasting to try the 2005, 2004 Brunello Riserva and 2006 Estate Brunello. All the wines look really good. However, if I had to pick one it would be the 2006 Brunello. Wow, amazing wine that looked great from start to finish. 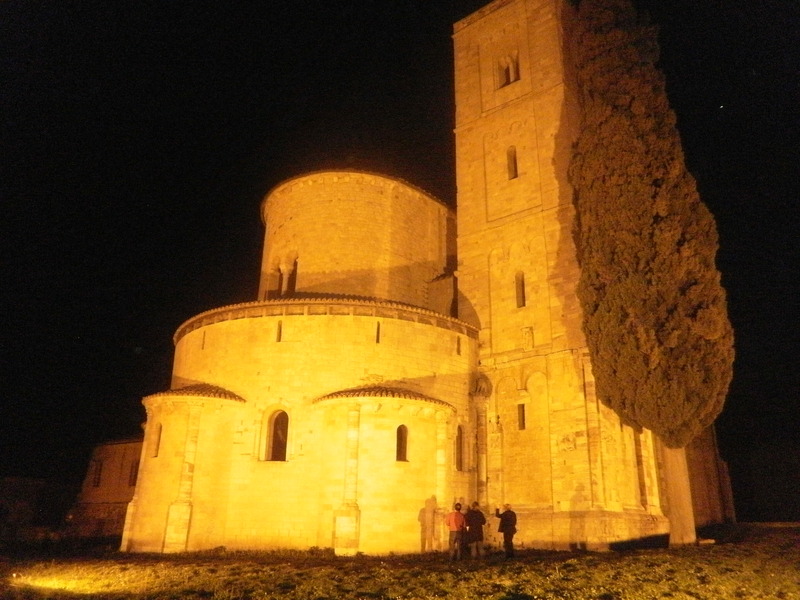 Before dinner Laura took us to Abbazio di Sant’ Antimo and it would have to be the most spiritually beautiful church in the whole of Italy. It’s mystic charm (together with chanting priests inside) made it an unforgettable experience. We then headed to Montalcino for dinner with Laura whilst Marco babysat their three kids!! 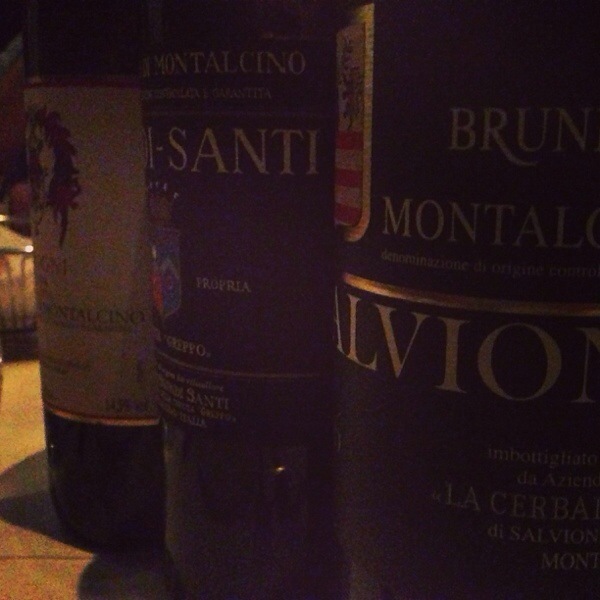 The wines stood up well during dinner and it capped off a fantastic day and night in Montalcino. I am now in Verona and ready for the craziness of Vinitaly. Already the town is buzzing and it is going to be a hectic few days. Whilst is a crazy time of year, I do love December. It seems like you work like crazy, then balance it all with some great family time together and then, as always, a very lazy January. This year has been even busier and I can’t really complain with family, work and life all treating pretty well. So far, I had to pick my favourite wine of December is would have to be the freakin amazing 1990 Fuligni Brunello di Montalcino served around a table amongst friends at one of our favourite restaurants called Scopri. 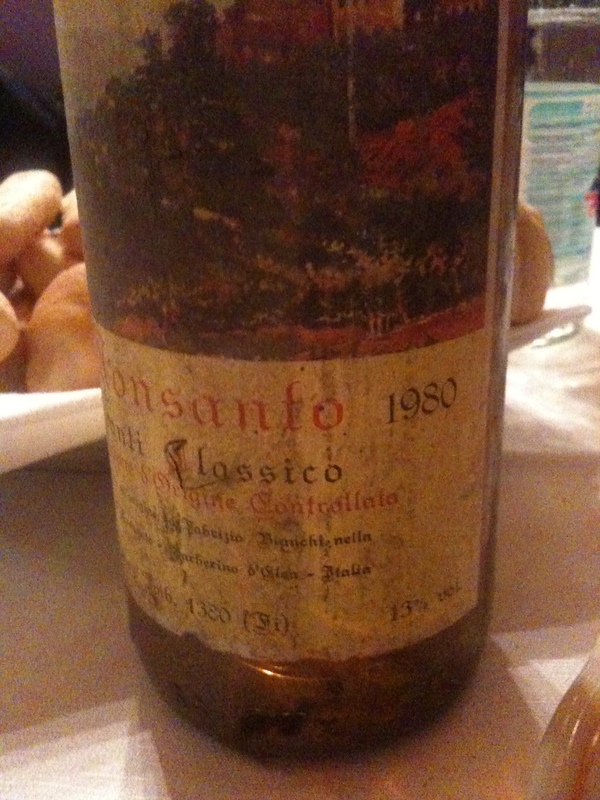 For some reason, when I sit down at dinner with fellow Italian wine lovers, I do not tweet or take photo’s of bottles. It doesn’t matter. This is the best bottle of Brunello I have drunk. Period. Tonight as I am about to eat a bowl of Pasta alla norma and drink a glass of the Fuligni Rosso di Montalcino, it reminds me of just how great that bottle was. And that is what December is all about: sharing great bottles of wine with friends. Tomorrow night I am heading back to Scopri with my tasting group and no doubt the December theme of sharing great bottles with friends will continue. More on the later in the week…. !